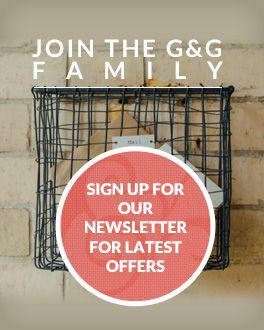 Grace & Glory Home Ltd is an online interiors shop stocking a beautiful collection of architectural hardware, lighting and fresh, functional homewares and accessories. Launched in September 2010, we are an independent retailer. Our passion for beautiful interiors comes from years of renovating properties together. We’ve combined our experience and knowledge of interior design and put together what we think is a beautiful collection of homeware that will work in both classic and contemporary homes. The products in our collection are both practical and stylish, and our online shop evokes feelings of nostalgia while being full of wonderful items for the modern period home. We are particularly proud of our beautiful collection of quality architectural hardware, and extensive research has gone into sourcing only the very best. Our range includes Butler's bells, sash window fittings, door furniture, letter boxes, hooks, escutcheons, beautiful handmade glass door knobs and cabinet knobs. Our customers might be looking to enhance their period property, replace missing original features, or be undergoing a complete renovation project. Please do contact us if you have any questions at all, even if you only need one door knob, we are more than happy to help! Bring Summer Style to Your Home Decor! Hygge & Lagom: What Can We Learn to Make Positive Changes to Our Lives?